Undertaking obedience with my dogs is something I would love to have the time to do but at the moment full time work and showing keep me from this sport. 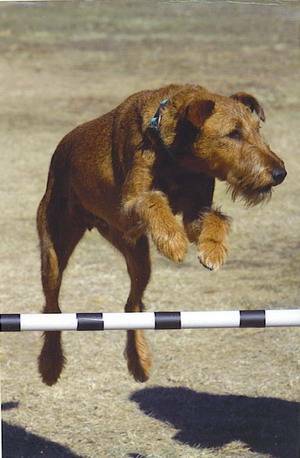 Special thanks to those who follow this pass time proving that Irish Terriers are a trainable breed. 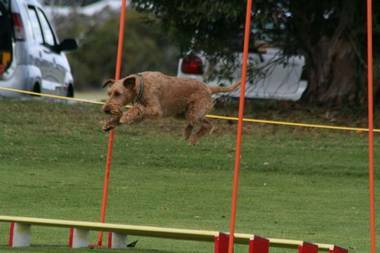 My pleasure in this sport comes from people like Vicki Anderton who ownes Anluan Magic Moments (Murphy) Australia's first Irish Terrier titled Jumper Dog. 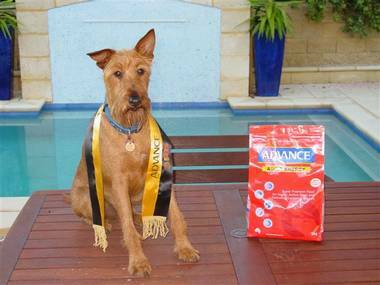 Murphy is highly decorated with multiple obedience titles including ADX, JDX and CD - being the first Irish Terrier in Australia to gain all these titles. NEWS FLASH April 2006 Murphy beat all comers in the State Excellent Jumping competition.Well done guys, I'm so proud of you. Vicki is also working with Anluan Flying High (Kelsee) shown above enthusiastically taking a broad jump and Anluan Kushti Bok (Kushti) pictured below. 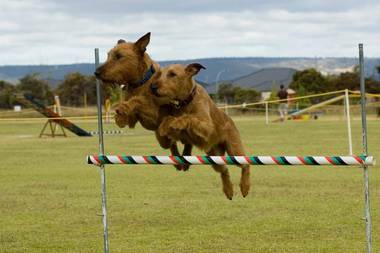 Also involved in the world of Obedience and Jumping are Tom and Pamela Connor. Two very besotted Irish Terrier owners. Pamela has trained Anluan In Like Flynn (Finn) to Jumper Dog as well as CD, he is well on his way to AD also. Finn is pictured below looking very impressed with himself. 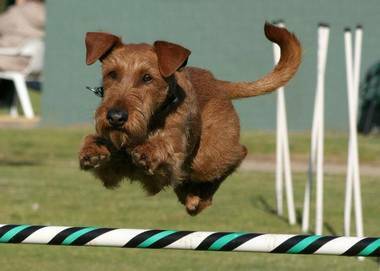 AND as we know one Irish Terrier is never enough. Finn's best mate is Nuala, she is pictured below with Finn, a great photo of dogs that have a strong bond. Most of these photo's have been captured by Darryl Bourne who has kindly granted his permission for me to post them here. For more amazing photo's please visit his website at the Bourne Archives . The Anluan / Coolaney Jumping and Obedience team! Finn and Kushti wonder where lunch is! !